Welcome to TexasCarLaws! This website will explain all car-related laws, rules and regulations in one place for quick and easy reference. Content on this website is for general information purposes only. We do our best to keep information accurate, but we will not be held liable for any inaccuracies. Please consult current TX state laws and DMV offices and double check all laws, rules and regulations with official sources! Different states have different laws regarding cracked windshields. A damaged windshield on your car can lead to all kinds of hazardous situations, but Texas traffic laws do allow driving with a damaged windshield under certain circumstances. Further clarification of the law is available below! Is driving with a cracked windshield legal in Texas? Texas laws do not mention cracked or damaged windshields. During vehicle inspections, your car will pass inspection even with a cracked windshield. However, windshield wipers are a part of your vehicle inspection. Any cracks which may cause the glass to change shape by becoming convex or concave can result in a failed inspection. Furthermore, Texas does have laws against obstructed views. You are not permitted to apply stickers, advertisements, or other objects which may prevent clear view of the road. In case the windshield crack is in your line of sight it can be considered distracting and you can receive a fine. Lack of proper rules and regulations means it’s usually up to each police officer’s discretion whether you’ll be issued a citation or not. Unless the crack is in corner and preferably on passengers side, it’s likely you will have to pay a fine and replace or repair your windshield or other cracked windows. The windshield is NOT an item of inspection. However, the windshield wipers are. Be sure that the crack does not cause the wipers to tear and that the crack has not caused the windshield to become concave or convex so the wipers loose contact with the windshield. Inspection guidelines above are only guidelines. While your car may pass inspection, police can still ticket you in case they determine your vision of the road is impaired. Should you repair or replace your windshield? Depending on the extent of the damage on your car’s windshield you may be able to repair it, or otherwise completely replace it. If the crack on your windshield is less than 3″ in length, or if you have a small chip which is smaller than the size of a quarter you should be able to repair your windshield, which will cost less than replacing it. In fact, your insurance company may even cover your repair bill if you have road hazard coverage, though you should consult with them first to see if they do. If your windshield is cracked directly in front of the driver’s line of sight some shops may decline repairing it, since even then it can obstruct your vision and cause safety concerns. If your windshield is too damaged you may have to replace it completely, which can cost a few hundred dollars. Do note that impaired vision is not the only reason why you should repair or replace your broken or damaged car windshield. 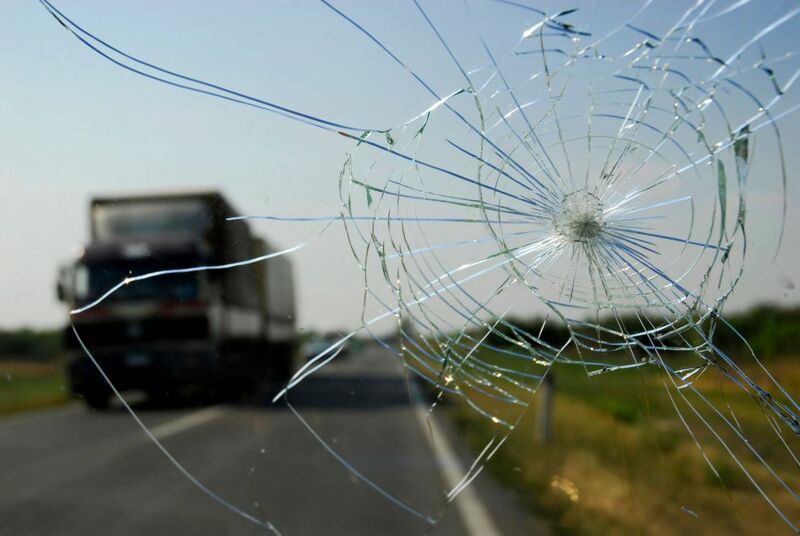 An undamaged windshield is stronger and in case of accidents can prevent further injuries. In a rollover wreck, the strength of the windshield/sealant system is designed to keep the roof from crushing more than 5 inches when there is a force of approx 1-1/2 times the weight of the vehicle on the roof. In a front end collision at approximately 30mph, the windshield/sealant system is designed to keep at least 50% of the glass sealed to the car which could keep occupants from being ejected. While you can drive with a cracked windshield and may avoid a ticket from police, it’s certainly not advisable as having a cracked windshield can be dangerous and potentially against the law. This article about Texas Cracked Windshield Laws was last updated in 2019. If any of our information is incomplete or outdated please let us know. Thank you! © 2019 Texas Car Laws. All rights reserved.